Mix up your holiday recipes by adding in some healthy low fat and low carb choices. Healthy options can be both tasty and fun and will often go undetected by the pickiest of guests. 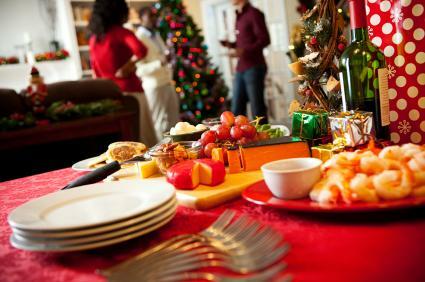 Eating healthy during the holiday season can help you stay on your diet plan and make for a festive menu that is nutritious and delicious. Offering your guests a low fat and low carb appetizer is a great way to offer them tasty treats while minding their diets. Usually appetizers are full of fat and loaded with carbs. Canapés based on pâte sucrée with high fat toppings are traditional at holiday gatherings, but consider using Asian and Mediterranean dishes that will please your crowd and cut the fat and carbs. Another way to make recipes low in fat and in carbs is to use substitutions. Rather than use recipes with tartlet shells, use recipes that include romaine leaves. Swap out bread and chips for fresh vegetables, so the carbs from the bread would be removed. In addition to trying out new recipes that are either low in fat or low in carbs, you can add in more fruits or vegetables, offer your guests sauces or dips on the side and serve items without lots of butter or oil. Try these healthy recipes for your next holiday celebration. This recipe serves four and works well for an appetizer as well as for a salad course. ¼ teaspoon of red curry paste. Wash the lettuce leaves and hold them in your refrigerator covered with a damp paper towel so that they do not wilt. This serves six and can be used as a dip for fresh vegetables or as a condiment for a sandwich. A selection of cut veggies including but not limited to carrots, celery, bell peppers, radish and blanched green beans. Slowly drizzle the oil into the garlic paste. This recipe serves 12 and is perfect to offer as a first course salad. Many families make it a tradition to have seafood at Thanksgiving or on Christmas Eve. Even though this recipe has breadcrumbs in it there are only 17 grams of carbs. It serves four. Prepare the mussels by cleaning them and removing any beards. Pour the cooking liquid into a saucepan and reduce until it is a tablespoon full. Pour the liquid into your food processor with the basil, garlic, pignoli, and parmesan. Heat under the broiler on high until the crumbs are crisp and the mussels are heated through. To make this meal a bit heartier and suitable for an entree, add in some whole wheat pasta and serve with fresh whole wheat bread for dipping. There is no need for butter or oil on the bread since the liquid from the mussels makes for a perfect dipping sauce. Desserts do not have to be complicated or loaded with fat to be delicious. Purchase an angel food cake which is low in fat and serve with light whipped cream and fresh fruit. This is simple, elegant and will satisfy your guests without adding extra fat or unwanted calories to their diets.